Sorry it has been so long since my last post! I must confess, I have done some cooking between then and now, but have been in such a whirlwind that I didn’t get a chance to take photos. I can tell you I have made ratatouille (which was delicious, and will definitely show up here one of these days); sweet millet kugel (tasty and low fat and should debut here at some point); green bean and tomato green goddess salad (mmm, dressing was made with buttermilk and avocado); and buttermilk carrot breakfast muffins (also really yummy so they will get their time to shine). In the meantime, here is a recipe for a new “salad” I just made. It’s meant to be a breakfast salad, and modified from the Hot Knives recipe, but I ate it for dinner. I threw some chicken sausage on top of mine. Feel free to add sausage (meat or veggie), or perhaps a fried egg or a dollop of sour cream. 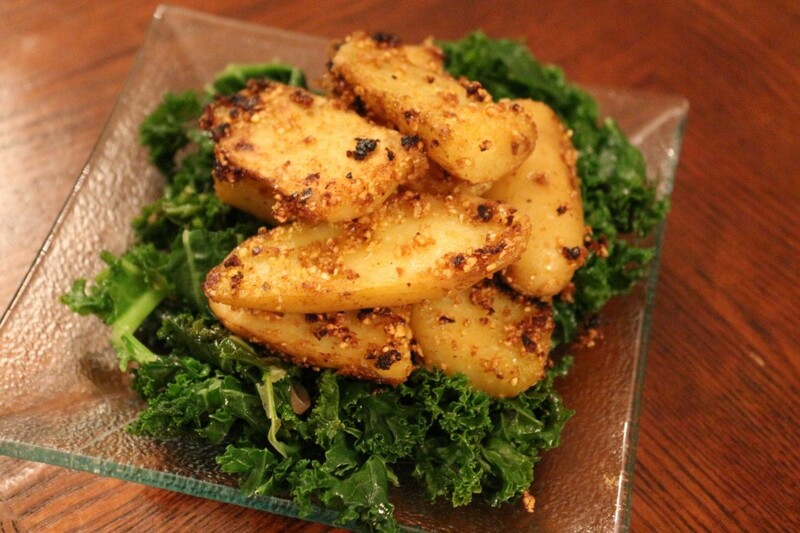 Either way, this is a delicious and healthy meal – a plate of warm kale topped with cornmeal crusted potatoes. 1. Rinse the potatoes and dry them well. Slice them in half lengthwise and place them in a pot of salted water. (Note, my fingerlings were kind of large guys, so I sliced them in half lengthwise and crosswise.) Bring the pot of water to a rolling boil. When the water boils, turn it off and leave covered, allowing the potatoes to sit for 5 minutes. 3. Rinse the potatoes in cold water and then pat dry. 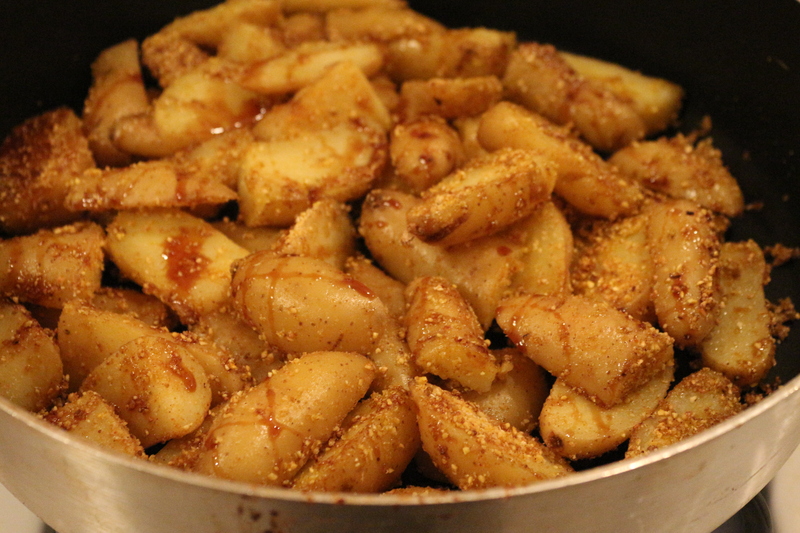 Place them in the bowl with the spice-crust and mix well until they are fully coated. 4. Heat 2 tablespoons olive oil in a nonstick pan or skillet over medium-high heat (I used a non-stick pan and it worked great). When the oil is hot, throw in the potatoes. Shake or mix the potatoes ever 30 seconds to a minute to keep them from sticking, for about 3 minutes. 5. Drizzle the molasses evenly over the potatoes, and continue the mix/shake routine for another 5-7 minutes, until the potatoes get crusty and soft. Remove the potatoes from the pan and place in a bowl. 6. Replace the pan on the stove top without washing and add 1 teaspoon olive oil. Heat over medium-high heat, and add the sliced shallots until they start to turn golden (about 2 minutes). Pour the wine into the pan and allow it to steam for about 20 seconds. Then, pour all the kale into the pan and cover. 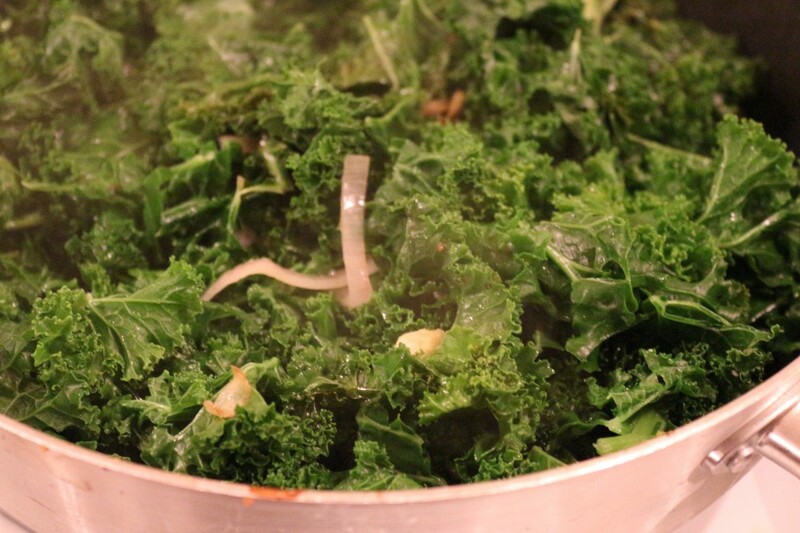 Allow it to cook until the kale reduces by about half (about 2-5 minutes). Once the kale is reduced, give everything in the pan a good stir. 7. Now you are ready to plate and eat. Make a nice bed of kale on your plate (add salt if you want it), and then top with as many potatoes as you would like. As I mentioned above, you can also throw on some sausage, eggs, sour cream, or other garnish (maybe some chopped green onions). This entry was posted in Breakfast, Mains, Salads, Sides and tagged Gluten Free, Kale, Potatoes, Vegan, Vegetarian. Bookmark the permalink.